"What did you do to the booze, Hickey? There's no life in it." 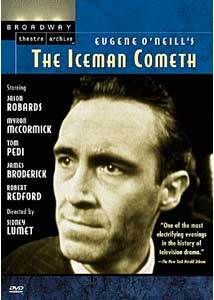 The Iceman Cometh is one of Nobel Prize-winning dramatist Eugene O'Neill's last plays. O'Neill's dramas became increasingly harsh and bitter as he went on, and this is no exception. As hinted by the title, this is a caustic marriage of religious experience and sniggering dirty joke. The combination leaves an unforgettable impression. The acclaimed 1960 television presentation on Play of the Week is presented here, and it is very much one of the highlights of televised drama of the time period. The action takes place entirely in the saloon of ironically named Harry Hope (Farrell Pelly). He and the other drunken denizens of his tavern, aged anarchist Larry Slade (Myron McCormick) young ex-anarchist Don Parritt (an incredibly youthful Robert Redford), failed revolutionary Hugo (Sorrell Booke), bartender/pimp Rocky (Tom Pedi), drunken newspaperman Jimmy Tomorrow (Harrison Dowd), and assorted lushes and hookers, are all awaiting the semiannual drunken binge of 'Hickey,' traveling salesman Theodore Hickman (Jason Robards). Always loose with his cash and good for numerous drinks, Hickey is the focus of the denizens of the bar, who keep going through their pipe dreams about returning to society as functioning members. When Hickey finally shows up, however, he's off the sauce and has experienced a mysterious epiphany. He goes on a crusade to get them to face up to their fantasies and see them for what they really are, and the result has untoward effects. O'Neill is not afraid to spend time amongst the dregs of society and see what makes them tick. The part of Hickey is an intense one and really the focus of the play, around whom everyone else revolves. This was, significantly, the role on the stage that thrust Robards into stardom, and he recreates his character here beautifully. Alternately harsh, mocking and compassionate, willful and self-pitying, Hickey is one of the great roles and Robards really runs with it. The supporting cast is excellent as well, although Tom Pedi's accent is occasionally too thick to make out much of his dialogue. Redford brings a serious earnestness to his smallish but important part, and he clearly demonstrates the charisma that would make him a household word in ten years. Even though the running time is nearly four hours (it was spread over two weeks when originally aired), the source material is also heavily cut. Most of the cuts are simple reductions of the lengthy speeches that most of the characters have, and generally works for the better. The other cuts involve language; although words that had never been heard on television before (like 'pimp' and 'whore	as well as several ethnic insults) survived, hundreds of instances of various oaths taking the names of god and Jesus in vain (apparently through fear of blasphemy charges) are eliminated. A sprinkling of a few such make it through, and their general elimination doesn't hurt the presentation much. Most of the many instances of the phrase 'pipe dream' are eliminated as well, apparently out of concern for the indirect drug reference. The pacing is clearly helped by the cuts for the most part. Even though this is expressly a filmed stage play, director Sidney Lumet doesn't play it out in a static tableau manner. The camera is fluid, zooming in and out scenes as necessary, but without being obtrusive. Medium closeups and cutting help maintain interest as well. The setting of the saloon is not quite naturalistic, but it's suitable for representing the nightmarish abyss of its inhabitants. One suspects that the ultimate Iceman, Death, would be a welcome visitor even on first sight, a conclusion that is only confirmed by spending a little time in the tavern. The program is complete with the original introductions by New York Times drama critic Brooks Atkinson. Although not adding much to the presentation, they do help put the play in context and prepare the 1960s' era audience for the sometimes shocking material they would be seeing. Oh, and the title references (not explained on the disc), for the curious, are Matthew 25:6, and the joke has the punchline "Not yet, but he's breathing hard." Image Transfer Review: This program was shot on videotape, and accordingly is lacking in detail and definition. Other than the title segments, which display dropouts and video artifacting, the picture is surprisingly good although overly soft. It is certainly superior to the kinescopes utilized in DVDs of the early episodes of The Avengers. Black levels are decent, although on occasion the picture is slightly overcontrasted. In all, very acceptable for video of this period. Audio Transfer Review: The 1.0 English mono is even more surprising than the picture. The sound has a low electronic hum and occasional extraneous noise, but for the most part dialogue is extremely clear and quite natural sounding. The music is slightly tinny but acceptable as well. Considering the noise levels on some vintage television programs, this is quite good. Dialogue, especially that of Rocky, can be hard on occasion to make out, but this seems to be a matter of slurred performance rather than problems in the audio. Extras Review: The only substantive extra is a Robards filmography, which is riddled with typos. The balance of the disc is taken up with the usual previews of other DVDs in the Broadway Theatre Archive series. These previews total about 54 minutes in length, and sometimes are quite substantial excerpts from the dramas. The plays are Working, Fifth of July, King Lear (starring James Earl Jones), Beyond the Horizon, Antigone, Alice in Wonderland, Ah, Wilderness!, Mourning Becomes Electra, The Royal Family, Hamlet (starring Kevin Kline), The Iceman Cometh, The Seagull and The Time of Your Life. Source material varies from fair to good; this disc seems to fall about in the middle. Oddly, these same previews appear on both discs, taking up substantial space (an entire layer) that could have been devoted to a higher bit rate or even better, a much-missed subtitle track. The classic presentation of O'Neill's great drama, with many excellent performances, given a decent transfer, considering the age and nature of the source materials. Lacking in extras, it's still very much worth consideration by those with a taste for classic and serious drama.